Compact tractors and lawn tractors have become staples for homeowners who have a lot of land with grass to mow. 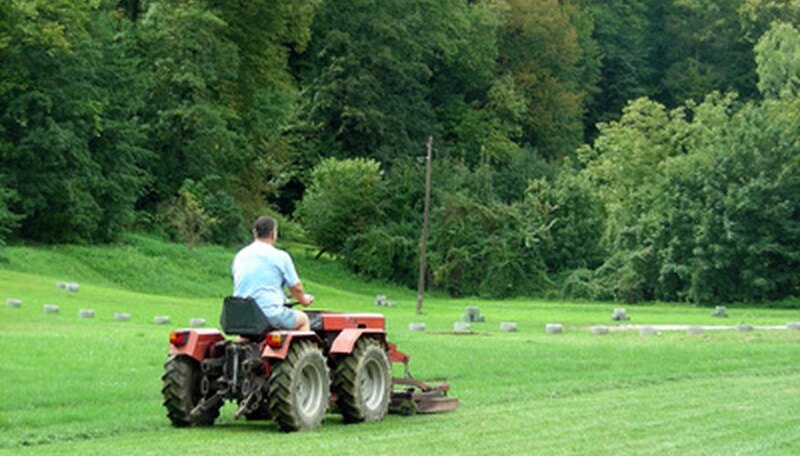 Essentially an oversized riding mower, a compact tractor allows the owner to cut grass, along with additional options for hauling, tilling and other yard and landscaping tasks. These machines do not come cheap. Research compact tractors to obtain the best machine for your needs. John Deere is a tried and true brand of tractors and heavy duty equipment. According to "Popular Mechanics" magazine, Deere's “green machine” is easy to use, and features a hydrostatic transmission with separate forward and reverse foot pedals, cruise control and an electronically controlled clutch. The tractor has fat rear tires for optimal weight distribution. You can engage the blades via a knob on the machine, as opposed to getting off the machine to transition into blade use. The only drawback noted by "Popular Mechanics" for this machine is that the large rear wheels may lose traction at times, and the tractor has difficulty on steep slopes. In addition, the green machine is a top of the line product that comes with a top of the line price tag. Craftsman produces a number of multifunctional tractors that are fast and effective for cutting and bagging. They feature zero-turn movement, which allows for cutting around trees and other obstacles. This machine offers electric deck height adjustment for an easy blade transition and manicured results. These tractors have large fuel tanks that allow for longer mowing intervals. According to Today’s Mowers, a lawn tractor review website, there are very few service issues associated with Craftsman tractors. However, newer models have different mount specifications, so be sure to check your model number before ordering attachments. Bobcat, a well know producer of Skid Steers and other agricultural equipment, offers a compact tractor with versatility and an easy to use three-point hitch. This allows you to transition easily between tasks without actually getting off the machine. The Bobcat features telescoping lower links and sway bars. However, this unit also offers power mowers, a rotary cutter, a post-hole auger, as well as a front end loader that can be used to carry gravel, dirt and debris. Bobcat offers a number of ways to personalize the machine, including options and accessories to add both comfort and task related efficiency. This machine has all of the essentials of a compact tractor for less cost than some of the more popular models.